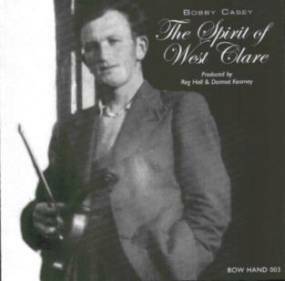 In the long-gone days when London enjoyed a thriving Irish session scene one of the musical figures you’d inevitably encounter on your travels would be the fiddler Bobby Casey, originally from West Clare, but resident in the UK from the early 1950s until his death in 2000. Though Bobby’s skills and knowledge were appreciated by all who heard him, he was very much a musician’s musician. His natural wit and unbound imagination, as exemplified by the titles of some of his own compositions such as The Hairy-Chested Frog, imbued his fiddling, leading one commentator to remark that “Bobby even ornaments his ornaments”. Bobby only made one solo commercial recording during his lifetime, 1979’s Taking Flight (long deleted), and a 1959 private recording, Casey in the Cowhouse, was briefly available during the 1990s. Thus the release of this new album of tapes made by Reg Hall (in 1966) and Bill Leader (1967 and 1971) will offer many listeners the opportunity to hear his music for the first time. And what an aural feast they’ll uncover! Played almost entirely solo, this glorious album provides not only an indication of the breadth of Casey’s repertoire, which encompassed a wealth of dance tunes as well as slow airs, but exposes a fiddler utterly at one with his musical craft. The best of the solo tracks are two sets of reels, each unusually consisting of five tunes, on which Bobby’s virtuosity is vibrantly apparent. Yet Bobby was always a sharer and perhaps the album’s stand-out piece is a duet with his fellow Clare exile concertina-player Tommy McCarthy on The Gallowglass/The Legacy. This review by Geoff Wallis first appeared in Songlines magazine.